Vacuum sales: At All Vac, Inc., we offer the best collection of vacuums for any type of service or space. Whether you are shopping for a vacuum for inside your home or need an industrial-strength shop vac for your workplace, we have what you need. Vacuum service and repairs: Even the best vacuums can require service and repairs after years of use. Our employees are highly skilled at providing any type of vacuum cleaner repair in Plano, TX. From routine maintenance to full rebuilds, we are qualified to offer you the service you deserve. Additionally, if you need central vacuum system repair in Plano, TX, let us know and we’ll come to you. 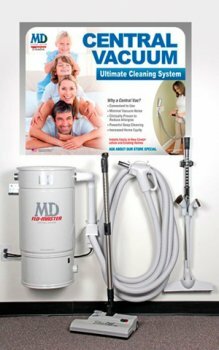 Vacuum system installation: Our experts bring you the very best in all types of vacuum installations, including hide-a-hose and central vacuum system installation in Plano, TX. These vacuum systems are sophisticated solutions to everyday cleanup problems without the mess and tangle posed by yards of wires and cumbersome appliances. Intercom installations: In addition providing outstanding vacuum cleaner services and sales, we also offer intercom system installations for your home or office. Intercom repairs and service: Many buildings come equipped with intercom systems that are woefully outdated and in disrepair. Give us a call and we will service and repair your system to make it functional once again. For everything from vacuum cleaners sales to intercom repairs, call All Vac, Inc. at 972-964-8793 and find out why our customers have relied on us since 1937. Mon - SAT 9a-6p, CLOSED SUN.